A picturesque Swiss winter over the Rhine River, the Basel Minster can be seen in the background. Rosy sunrise over the Rhine in Basel. The modern entrance to one of Basel's cultural offerings; Museum Tinguely. In our essential Basel city guide, Robert Upe dives into the culture and unique food of Switzerland’s northern city, and partakes in one of the world’s most bizarre swimming experiences. Its art fair, watch making, and the Rhine River. Basel boasts a number of dishes all its own, from Basler flour soup – traditionally served with cheese and onion tart or suuri lääberli (sour liver strips); to sweet treats like Basler Läckerli – small gingerbread biscuits with a delicious sugar icing; and Mässmogge – colourful thumb-length sweets filled with a hazelnut mixture that reach their seasonal zenith at the Basel Autumn Fair or Basler Herbstmesse in October. Basel also prides itself on its fine dining. Try Restaurant Gifthüttli, a classic Swiss pub/restaurant specialising in cordon bleu cooking; or Restaurant Stucki by Tanja Grandits, which has two Michelin stars and a faultless menu of artistically presented haute cuisine. Art Basel is one of the world’s premier art events, underlining Basel’s strong cultural and arts offering. 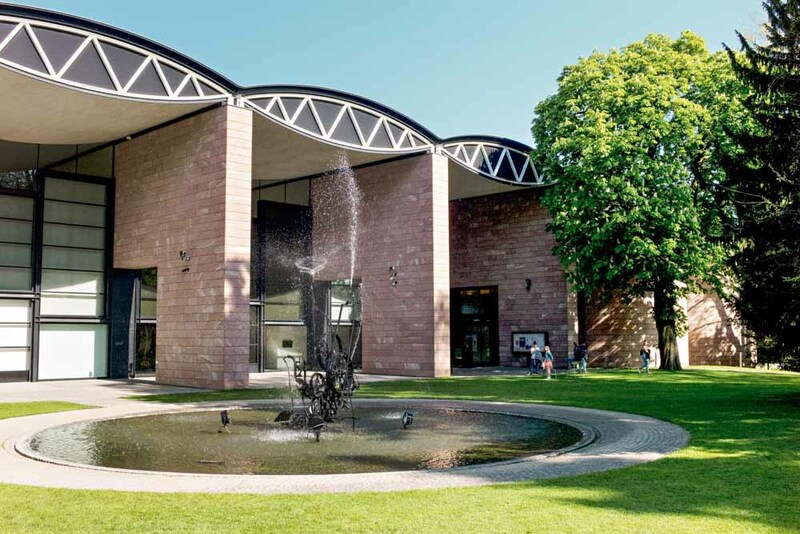 But you can get an art fix all year round at some of the city’s world-renowned museums such as Kunstmuseum Basel, Fondation Beyeler, Kunsthalle, the Tinguely Museum, or about 40 others if you have the time. For something fun, see the Hoosesagg Museum in the Old Town, the city’s smallest museum. There’s no door – just peer through the window at what’s on show. The mighty Rhine River is a focal point of the city; take a lunch cruise along it or cross it via cable ferry. And one of the nicest ways to tour the city itself is in a vintage tram. Public transport is free with a Mobility Card, available to guests staying at Basel hotels. When looking for retail diversions in Basel you should start at the bustling Marktplatz. The town’s central cobblestoned square is adjacent to the 500-year-old town hall, and market vendors here sell fresh and organic produce, spices, flowers and a fascinating array of smallgoods. During the warmer months there are food vans, with big beach umbrellas to protect you from the sun, where you can fuel up with a wurstel sausage and mustard roll. The Old Town is full of craftsman stores like the Johann Wanner Christmas House with its handmade baubles, decorations and Swiss souvenirs. Most shops are closed on Sundays. 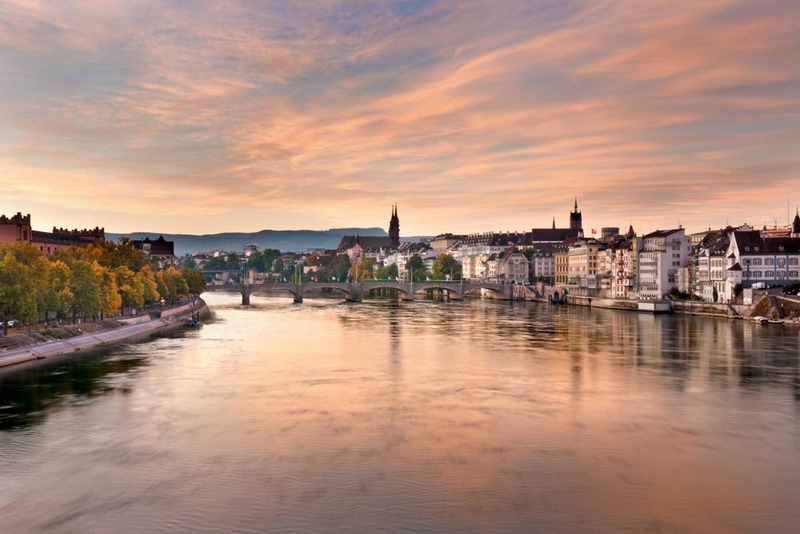 Basel is an unlikely swimming destination, but one of the favourite warm-weather pastimes here is taking a dip in the fast-flowing Rhine River. Baselians love to jump in whenever they can. It’s impossible to swim against the strong current, so go with the flow. You’ll need a watertight bag, called a wickelfisch, for your clothes and towel. Available at local shops and some hotels, they also act as a buoyancy device as you float along. Stick with the crowd to be safe, and to identify the easiest exit points from the river. Once you’re done, dry off and then take a gentle stroll back to your starting point, stopping for a wine and pretzel along the way. 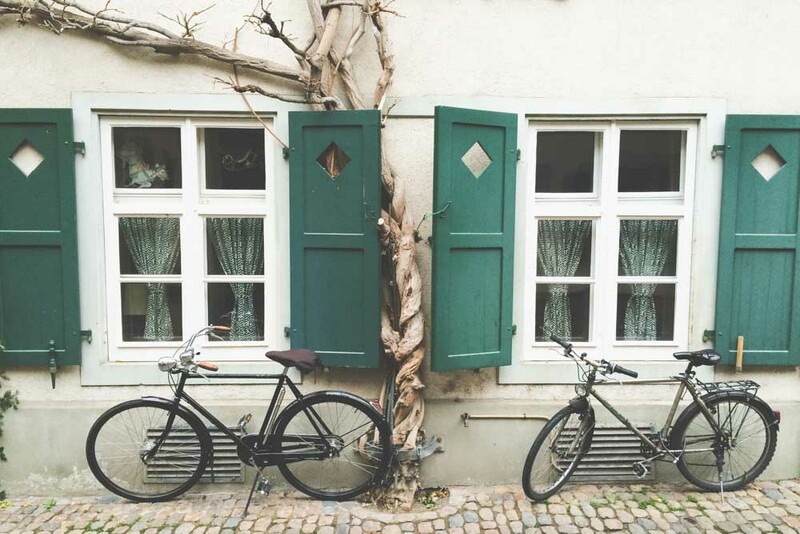 Try Stadthauscafe, with its delightful courtyard and good cake selection, as well as the equally good Fruehling or La Fourchette. Hotel Basel is well positioned in the heart of the Old Town. 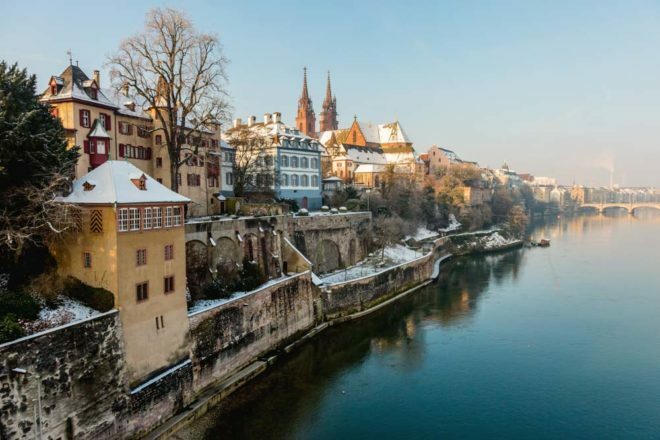 Stepping up in class, Hotel Les Trois Rois is a grand property sitting pretty on the Rhine River, complete with a multi-award-winning restaurant, Cheval Blanc.